A sure sign of spring. 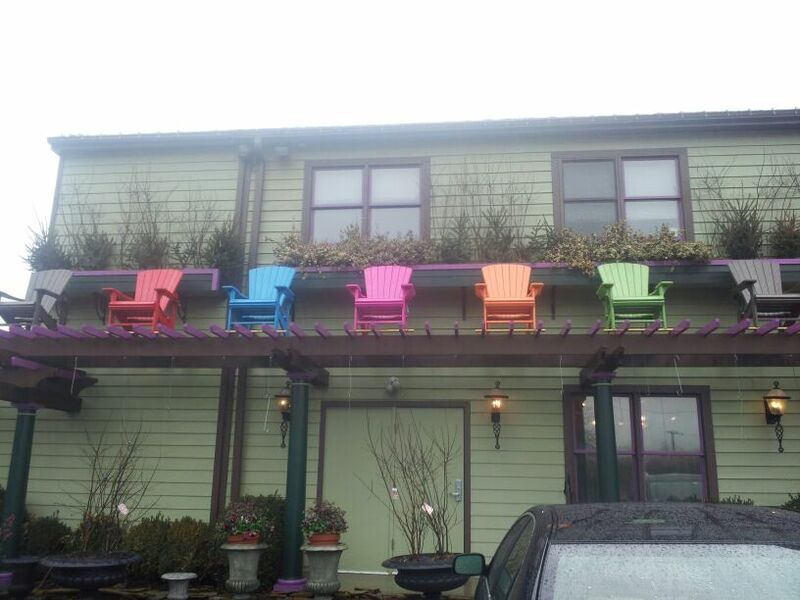 Colorful Adirondack chairs on the roof of Rhoads, a wonderful garden/landscaping shop in North Wales, PA.
Green spring cleaning has revealed something very important, from a redecorating perspective: I have way too much furniture for this apartment. My home has a grand total of 750 square feet, spread through a large living room, narrow dining nook, small kitchen and bathroom, decent-sized bedroom and a lot of closets. As I’ve cleaned out the closets and drawers, and sorted out books, knick-knacks and storage containers, I’ve uncovered the basic decor of my apartment, the furniture on which I would base my redecorating scheme. And there’s a lot of furniture. Just in the living room, there’s enough furniture to line every wall. A giant entertainment armoire and two matching bookcases. A sofa, side chair and large sofa table. Another two bookcases. A side table, desk and chair, sewing machine cabinet, entry table, two giant stereo speakers and floor lamps. Add in the full-size, round table and chairs in the dining nook, and you face a forest of wood. Things aren’t much better in the bedroom. Canopy bed and two end-tables, bureau, dresser, cedar chest, bookcase and a large armoire. Lots of pieces in which to store clothing. As if I didn’t have a nice-sized closet in the bedroom. the thing is, much of this furniture doesn’t belong to me. There are pieces that belonged to various relatives and family friends, and ended up with me because other relatives didn’t have room in their full-sized homes for them but didn’t want to let them go out of the family. Like the table and chairs, which were meant to replace the old dining set in my Dad’s kitchen. I was supposed to have them until he redid the kitchen. Years and years on, the kitchen still hasn’t been redone, the old furniture is now breaking, and yet the good table and chairs are sitting in my apartment. They’re much too large for the dining nook, which is only 40 inches deep, but every time I mention giving them back to Dad, no one wants to take the time to move them back to his house. Same situation with the sewing machine cabinet, bedroom armoire, desk and chair, which all came from my grandparents’ home. These pieces were given to me to hold until room was made for them at someone else’s house. But, no one ever seems to want to take them back, and so they’re still sitting in my place. I will admit that I did need the armoire at an earlier apartment, which had huge rooms but tiny closets. However, I’ve been in this apartment for years, don’t use the armoire for anything, and still, every time I mention that they can take back the armoire, I get an excuse — can’t do it right now, don’t have a truck to move it. The same excuse extends to the desk and chair, the sewing cabinet, and so on. The truth is, sentimentally, none of us, including me, want to let go of the memories that are attached to these items. The armoire held discarded clothing, jewelry and accessories, and on weekends, we children would dress-up and play fantastic games. The desk and chair were where, every Sunday, my grandfather would sit and do his Lodge work while his grandchildren watched TV and waited for him to finish so he would tell us stories. My grandmother used the sewing machine to help my mother make clothes and costumes for us. I’m as guilty as everyone else — I love these memories. But the reality is, I don’t, and never did, have room for these pieces. Someone needs to take them, someone with a larger house and better storage facilities. I just need to get them to understand that fact. And possibly, rent a U-Haul and physically move the furniture for them. Only then will I be able to redecorate properly, as I’ve been meaning to do for the last three years. Either my kitchen has decided to kill me, or I’ve acquired gremlins. Those are the only things I can come up with to explain the odd occurrences this evening. Green spring-cleaning. I set myself the task to go through every drawer, cabinet, closet and cranny in my home, and once and for all decide whether to keep, or set free, the contents. The goal is to be green — to recycle, reuse, sell or give to a good home as much of my unwanted stuff as possible, so that I don’t transfer the clutter from my home to a landfill. And along the way, to get a good look at the basics of my home, and repair or replace anything that is worn-out. I don’t think the kitchen wants to cooperate. My kitchen is quite small (the only real drawback in this apartment), only about 8 feet long, and sorely lacking in counterspace. The basic cleaning only took parts of two evenings. I pulled every plate, bowl and pot out of the cabinets, and stacked them on the dining room table. Most of my serving and cooking prep pieces are new, and so obviously I’ll be keeping them — although having put everything in one place, I was somewhat surprised at the sheer volume of red cookware and serving pieces I have. It’s possible I have become obsessed with the color red when it comes to the kitchen. The dispute between the kitchen and I arose when I began applying a good polish to the wood cabinets. Now, much of my apartment has been renovated over the years — the management is really great about the upkeep on this complex. But with the exception of redoing the linoleum when it began to lift up, and replacing the refrigerator and dishwasher after a power failure, the kitchen’s remained relatively untouched during my tenancy. Translation — the cabinets date back to the year the apartment building was built. In, I believe, the 1960’s. And they’re showing their age. As I polished, I noticed that the molding strips are detaching from the cabinet edges. That the wood is chipped along the bracers. That the cabinets themselves are, well, dingy inside. You don’t really see these things unless you’re looking closely, but now that I’ve seen them, I can’t help seeing them every time I look at the cabinets. Oh, the polish helped — I absolutely love how Method’s almond oil sinks into the wood and gives it a glow — but even with the polish, the cabinets appear, frankly, dull. I may have said that out loud while talking to someone on the phone. I may even have mentioned that I was going to talk to the management, see if there’s some way to do an upgrade or repair to the cabinets. And it’s obvious that the kitchen resents my remarks. It hasn’t exactly been shy about letting me see that resentment. After washing all the dishes, I began refilling the cabinets. Twice, as I was placing items back onto the shelves, the doors that ordinarily hang open without moving swung into my head so hard I saw stars. I don’t recall nudging them so that they would move. Then the appliances got into the act. I went to heat water for tea, and the burner underneath the kettle, which was set on low, abruptly turned cherry red and nearly burnt the bottom out of the kettle. The microwave refused to shut off as I was defrosting some soup for dinner. The refrigerator froze the milk, lettuce and eggs. Either my kitchen is determined not to have a cabinet facelift, or else I have gremlins. I don’t know which is preferable — that there are little malicious creatures sharing my home with me, or that my appliances have achieved sentience. Or possibly I’ve gotten a mild concussion from being whacked on the head once too many times tonight. On the plus side, I believe that most of the items I’ve taken out of the kitchen will find a new home, and not end up in the landfill. I found quite a collection of cookie cutters and cake decorating equipment — which I haven’t used since my friends’ children got out of grade school. I also discovered that I have enough wine glasses and decanters to host a small reception for 50 people, three different teapot and sugar/creamer sets, and more matched candlesticks than any sane person needs. I’ll list them on Craigslist this weekend, or offer them to friends and/or co-workers who might need things like that. I did toss out one pot, which had a very loose handle, but otherwise my green resolution is going strong. There are a couple of minor repairs needed in the kitchen — small things like replacing light bulbs, cleaning the grease trap on the stove hood and declogging the garbage disposal. I also decided that it was time to replace the rug — a red one will definitely brighten up the kitchen. (I know — I’m obsessing on that red color again.) I’ll be taking care of those tasks this weekend — if the kitchen lets me live long enough. Meanwhile, I’m going to go take two more aspirin, which fortunately are not kept in the kitchen. The approaching snowstorm notwithstanding, spring will arrive in 15 days. It’s time to start that annual optimistic exercise known as spring-cleaning. Every year, I spend a few days cleaning out my apartment before spring. I vacuum down walls and shampoo carpets. Invest time in waxing and polishing all the furniture. Turn mattresses, wash slipcovers, wax floors. And inevitably, in sorting through a few closets and drawers, I pull out some items which are broken, or no longer needed. And usually, those items get thrown out. But our landfills are taking over the countryside, filled with discarded items containing toxic substances that could pollute our environment. Charities in the area are always in need of household goods and spare clothing. And there are some things that I’ve bought, or been given, that I never/no longer need, that could be sold and the funds used to better purposes. And so I have decided to spend the next four weeks in a deeper form of spring-cleaning, “green(ish)” style. I’m going to go through every closet, every drawer, every item in storage. I will be ruthless in my culling — if I haven’t used it, read/watched it or even thought about it for at least a year, it will be up for disposition. But instead of throwing things out, I’m going to see how many of these items can be recycled, either by sale or donation. Some things will be easy to handle. Clothing, books, entertainment media — these items can all be either resold at used stores or donated to libraries, charities or shelters. Old computers or televisions can be taken to a recycling facility. But then what do I do with old furniture? I don’t have a curb to place it on, so that people driving by can take it and give it a better home. I have a plentiful supply of knick knacks, those little gifts that inevitably turn up as presents at birthdays and holidays. Can I list them on Craigslist? Or can they be donated to a charity that can resell them and earn much-needed cash? My goal is to recycle/donate/sell at least 75% of my discarded items. Stay tuned for updates!